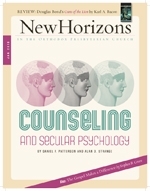 Does secular psychology have any valid role in Christian counseling? Can the Christian possibly learn anything from the secular psychologist? These questions are hotly debated in Christian circles today, and Christians have taken sides. Counseling, like preaching, requires the counselor to illustrate points and make them clear. To do so, the counselor draws on personal experience and reading, and develops a repertoire of illustrations and quotes. I recently added John Calvin's Institutes of the Christian Religion to my list. The germ of Calvin's insights follows. Your phone rings late at night. The voice on the other end starts off with "I know it's late, but I need your help." The crisis your friend is experiencing might be one of a thousand things, but her circumstances are painful and she is reaching out to you for help. Can you help her? Do you have anything to offer her? Over the last decade, one of the growth industries within the church has been that of counseling. Various models of counseling are on offer out there in the theological marketplace, some obviously laced through with secular psychology, others more self-consciously based upon biblical principles. I have neither the time nor space nor interest to offer critiques and assessments of the material content of these various approaches; what interests me at this point is the phenomenon of such counseling.